Premier is on Petkovškovo nabrežje embankment very near Prešernov trg square. Lately this embankment has became very popular so on sunny days it is almost a problem to get a free table. Even in winter time, since blankets and heaters are provided. Premier has a wide selection of beer. Beside local beers there is also Guinness on tap and numerous bottled beers. 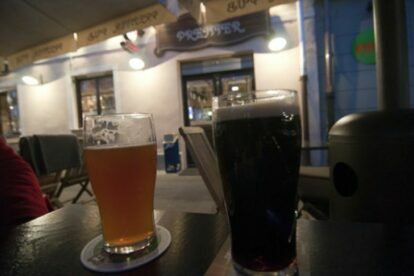 Like tasteful Czech beers, London Pride, London Porter and others. Overall none of them really need any extra presentation but there is one that most definitely needs it. That is a first local craft beer called Human Fish Beer after a Slovenian special amphibious, animal that is known as Human Fish (but is not actually a fish!). Their tasty beers and the sunny embankment will make you wanna come again! And don’t worry if you have hard time understanding which bar is which, just sit down wherever you can. Good selection of beers has spread to the neighboring bars as well, so you’ll be fine.